B 747-400 Simulator Project - Austria! Here's a quick update before X-Mas. I'm working on the instructor station, the sidewalls, closing my shell and the visual as well. I got three LG beamer in the meantime as well. So, lot of different tasks to be managed and done in the next few weeks. More pictures will be available in Q1 2018. This time I'm going to show some pics and background info’s of my handcrafted Oxygen Mask Stowage Boxes and Masks! Too long time ago since my last update. But I finished a lot of tasks in the meantime: all Overhead Panels have been cleaned, all blank and dummy cover panels for the AFT Overhead and the Pedestal have been manufactured as well. Last but not least, the motor for A/T has been installed as well. Now I had some time to put new pictures online. Additionally, I found a very interesting document about panel building and their measurements. Thankfully the author, Hessel Oosten, granted the rights to put this doc on my Downloads page. Enjoy! On December 7, I picked up my full B 747-400 Overhead panel and some important panels for my Pedestal. Again, I purchased the parts from Universal Asset Management! See some pictures here! Wow, what a long time since my last update! I have a long business trip and holidays behind me and finally managed to update my website. But - I sincerely hope - it was worth the waiting. Please find the new report Building my DSTD - Part 3 here. I started redesigning my reports. So you will recognize a new responsive layout as well as a new gallery with better full screen and mobile device support. Simply try the new look and feel. I hope you like it! Another new link to a company I purchased some great RMI Knobs from, is available on my Links page. AIRPOWER16 is one of the largest airshows in Europe! Organized by the Austrian Armed Forces in collaboration with partners Red Bull and the province of Styria. The event will take place on Friday 2nd and Saturday 3rd September 2016, at Hinterstoisser Air Base in Zeltweg, in the province of Styria! Please click the logo for further details! Just to let you know that I'm working hard in the background. Soldering lot of wires, buttons and switches, as well as learning how to use SimStack are the main tasks at the moment. My schedule is to complete the MIP in the next two weeks. Once finished, I will put lot of new pictures on line. In the meantime enjoy a great B 747-400 farewell video! A bit later than expected, but finally 37 new pictures and lot of background information are online! I spent lot of time and effort to pimp the panels and increase the realism. On the Videos tab you can find an amazing video how a B 747-400 cockpit is cut off from the fuselage. Have fun! New Year and new space for new information! You will find the history of the old news feeds in the Archive at the very bottom of this page! Stay tuned for more updates; latest at the end of January! Btw: if you don't want to miss a major update, simply use my feed service. Find more information and the subscription button on the tab with the RSS logo, or click the RSS icon in this paragraph! Cheers & have a great and healthy 2016! A new picture gallery has been uploaded. Lot of pictures of the DSTD from Flightdeck Solutions and the present state of my simulator. I will continue working on my setup during the holidays. So another update will be released approximately at the end of January 2016! My parts from Flightdeck Solutions arrived in the meantime. I am working on my setup in my spare time. Lot of photos are taken. I will compile them to a first report soon. Sorry for the delay, but at the end of the year the workload in my daily business is huge! Just another intermediate update: my DSTD parts from Flightdeck Solutions should be ready for delivery next week! As soon as the parts arrive, I will post pictures. In the meantime the SimStack interface cards from Simulator Solutions arrived! Stay tuned for more details soon. Additionally I put 161 pictures from my old Project777 site on my Downloads page. Feel free to download if you are interested in! Just to keep you informed: I'm eagerly waiting for my B 747-400 parts from Flightdeck Solutions! MIP, MCP, EICAS, CDU etc.! In the meantime I'm enjoying the summertime and sorting out the wires of my genuine 744 TQ. Have a great summer too - I'll post lot of pics once the items arrive! Another important part is done! All four Thrust Levers are now linked to potentiometers. Lot of detailed pictures and technical information are available here! My handcrafted Intercom Handset and Cradle unit is ready to be mounted on my Pedestal. Luckily I was able to match the color to fit perfectly. Enjoy lot of pictures here! Conversion of the Flap control lever assembly is done. See some pictures here. Second, I added a link to Britjet's excellent PSX Training Videos on my Videos tab. The motorized Speed Brake mechanism works fine. See the pictures and tech data in my picture gallery as well as a video on the Project tab! My Parking Brake solenoid mechanism is ready. See the pictures in my picture gallery as well as a video of the working mechanism on the Project tab! Some new TQ pics have been uploaded to my gallery. New gallery software with better interactivity is online as well! Text boxes with descriptions are now available for lots of pictures in my gallery. You are welcome to check it out! Yesterday in the afternoon I picked up my Throttle Quadrant. See some pictures on the Pictures tab as well as more information and a short video on the Project tab! Some new links have been added as well. I hope you all had great Christmas holidays and a good start into 2015! I took a few days off - right now, I am back discovering PSX to ensure, not to forget vital parts in my sim setup! In the meantime I put two interesting Jumbo gear swing videos on my Videos page! Enjoy them! Another new video of my linked Boeing Rudder Pedals is online! Have fun watching it on my Project tab! A new video of my linked Boeing Control Column has been uploaded! You can watch it simply by clicking my Project tab! Another video of my linked rudder pedals will be uploaded soon. New pictures have been uploaded to the picture gallery, existing pictures of my project have been updated. 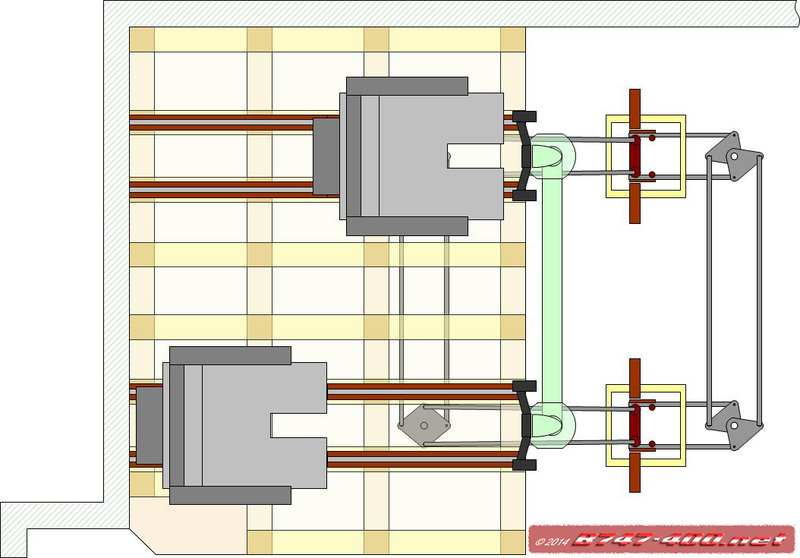 A technical drawing of my linkage is available in the Project section. Have fun! My new RSS feed service is available! Please find more information and the subscription button on the tab with the RSS logo, or click the RSS icon left! Welcome to the new website of my Boeing 747-400 Simulator Project! The site is under construction! More to come very soon. Some pictures, videos, a few downloads and links are already online. The Contact tab is also working! This is not a new project. Former it was known as Project777.com! Over the years I mentally came back to my favorite plane, the B 747-400. Now, as Hardy Heinlin released his excellent Precision Simulator X, the next logical step is finishing my setup! Of course: a huge step! Please do not hesitate to contact me via the Contact tab on this website! The motorized Speed Brake mechanism is done and works fine. I'm using the 12 V RB 35 1:200 Gearbox Motor from Conrad to drive the lever, an axle, two ball bearings, two gears and a 10 K potentiometer. A Mentor 716 Safety Slip Coupling connects the motor and the push / pull mechanism with gears and potentiometer. This is necessary to enable a manual movement of the lever. So the friction clutch is important for protecting the motor from being damaged when reaching the down and up position or manual operation of the lever. Two micro switches - again out of an old VCR - are used to sense whether the Speed Brake is armed or not. Additional pictures and some more technical data of the components are available here. A special thank you to the employees of Wien Work for their kind and great support cutting a thread into a joint head! The Parking Brake mechanism is ready and working. I used an old PC Expansion Slot cover plate as carrier for the two switches. Why two? Well, more strength for holding the Parking Brake lever and a redundancy if one switch fails someday. A spring supports the switches to hold the weight of the lever. A push / pull rod operates the switches, and is connected to the solenoid as well. The solenoid is from an old JVC VCR, I took apart long time ago. Fortunately I kept it. 6 V are enough to pull the rod. Weight and gravity are doing the rest. The lever falls down to its released or OFF position. Pictures are available here. Another huge step: my Throttle Quadrant arrived at its final destination! Well crated in a box of total 272 lbs. Big thanks to Tom Anderson from Universal Asset Management! It was a pleasure making business with Tom! The Throttle Quadrant has been removed carefully - all parts and pushrods are working fine and are unharmed! See a first video here and enjoy more pictures in the picture gallery. Here is my B 747-481D Throttle Quadrant of a retired Jumbo Jet from ANA! I'm eagerly waiting having my hands on the thrust levers the very first time! As you can see, it seems to be in a great condition! That's the reason that my B 727 Throttle Quadrant will be sold in the near future. But now enjoy the pictures. Click them to enlarge. Another new video of my linked Boeing Rudder Pedals! More pictures with technical details are visible in my picture gallery. Here's a new video of my linked Boeing Control Column! Additional technical pictures are available in my picture gallery. Currently I am continuing the (re)planning phase of my B 747-400 Simulator Project! Seats, linked rudder and control columns are still ready and working. Please have a look at my picture galleries. A lot of old and new photos are avilable. You can see how my Boeing parts have been cleaned and repainted! Lot of details of linking my control wheels and rudder are visible too. A technical drawing how I linked the controls is below for a better understanding of my pictures. Please click the thumbnail to enlarge! December 7, 2017 - Three LG Beamer arrived! September 24, 2017 - Oxygen Mask Stowage Boxes ready! Ejoy pictures and reports of my project! Handcrafted Oxygen Mask Stowage Boxes are ready! Please find my latest report here! Overhead panel cleaned and A/T completed! Building my DSTD - part 3! Building my DSTD - part 2! Finally I finished the modification of the CDU bay to fit to my genuine B 747-400 TQ. Luckily I was able to find some Honeywell pushbutton switch guards on ebay. After modifying them, and drilling some new holes, they fit excellent to the pushbuttons and the panel cutouts. Also some backlighting for MIP and MCP has been installed! I created some instrument and MIP placards with Photoshop. I purchased two 7" Displays, for the chronometer and RMI instrumentation. Enjoy the pictures and some explanation below! Building my DSTD - part 1! November 20, 2015: I picked up my first package from Flightdeck Solutions at the airport. Everything was packed very thoroughly. Some parts are sent in a second box to me four weeks later. Again, carefully wrapped. So no damages occur on the long journey from Ontario to Vienna. It took me some time to start building, because I had to adjust and modify some existing parts of my base construction to make the DSTD fit perfectly. Now, during the holidays, I will continue working on my setup. More pictures with lot of details of how I add additional details to the structure etc. will be posted approximately late January 2016! Thrust Lever linked to Potentiometer! First I removed the existing pushrods from my TQ stand. Then I removed the joint heads to build my own small pushrods. After cutting a 3 mm thread into the joint heads, I used a 3 mm threaded rod and a Maxi ball joint M3 Polyamide from Conrad to complete my four pushrods. Four sockets from an old wardrobe are exactly what I needed to mount the potentiometer. Some drilling and cutting, and they fit exactly! Way more fine tuning has been necessary to create the leverage for interconnecting the potentiometer to my pushrods. To fix the leverage on the potentiometer axle, I used four wire rope clamps from a hardware store. Finally I put all the parts together and soldered the cables. Completed so far, I mounted the unit into my TQ stand, and connected the leverage of my unit to the TQ autothrottle servo unit. Please find more descriptions adjacent to the pictures below. I kept a handset from an old analog telephone. This handset fits perfectly to my pedestal. The cradle is handcrafted from some layers of cardboard and wooden strips. The cradle is very robust! To cover the layers and make the cardboard cradle look better, I used Acrylic Spray Putty. I sprayed several times with some drying time and sanding between. Finally I painted the cradle with brown color. Luckily I found a color very close to the original Boeing brown. To make it fit perfectly to the Boeing OEM color BAC #8328, I matched the color simply by adding some dark brown, red and black color into the base color. Enjoy the pictures and more details in the text boxes! I removed the Flap control lever RVDT (Rotary Variable Differential Transformer) assembly from my TQ stand to convert it with a 10 K lin pot. After removing the transmitter from the backside of the assembly, I mounted the poti. To make the potentiometer axle fit into the existing rotor shaft, I used an aluminum tube. See detailed pictures in the gallery below! See lot of pictures how I constructed the motorized mechanism. Technical details are visible in the picture text boxes. A video of the working mechanism is also available on the Project tab! Enjoy! Parking Brake mechanism with solenoid! Some pictures how I built the mechanism. More technical details and a video of the working mechanism are available on the Project tab! First pictures after picking up my B 747-481D Throttle Quadrant! 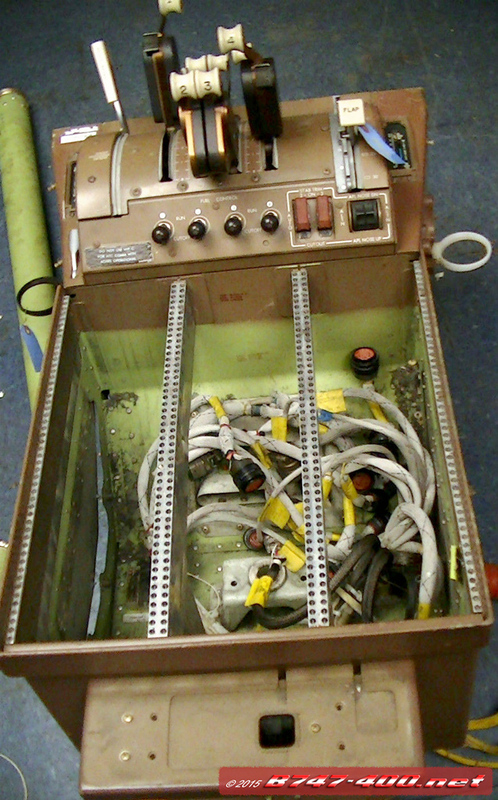 My TQ from Universal Asset Management needs some cleaning and technical preparing for the use in my simulator. The TQ is in a very good shape. No broken parts, no damages. It is in a good and fair used and AR condition. Next step is the integration of the Potentiometers. More to come soon! My setup as of October 2014! Here you find lot of pictures from the very beginning, the overhaul and paintshop of my parts, as well as some pictures how I did the connection to potentiometers. Here are some of my shots of the last Airpower 2013 at Zeltweg / Austria! Unfortunately the Airpower 2015 has been cancelled. Our Austrian Armed Forces needs to save money! Please enjoy pics of my first 'simulator'! Wooden construction with a ThunderSeat. The built in subwoofer was a very nice ButtKicker! Plus a B 727 gear lever in AR condition, IPECO seats from old B 727th (FedEx and United), and complete control column. The column is either from a B 727 or B 737! 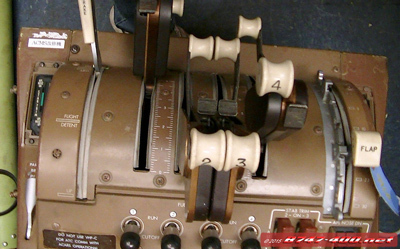 The rudder pedals came from an old B 707 as far as I know. All pictures are from former Project777 - so don't be curious because of the logo! Collection of great videos featuring the B 747-400! Video content hosted by YouTube. Please report broken links. Thanks! Excellent video! It must have been very emotional for all the pilots and passengers as well. No more words - enjoy great pictures! An awesome video how the cockpit section from a retired Lufthansa B 747-400 is is cutted out from the fuselage. See more pictures on Concord Virtuals Facebook presence! A series of excellent educational videos how to operate the B 747-400 using PSX. These videos are created for private and home simulator use only. Not for any commercial pilot training in any way! Access to these comprehensive videos is given via the Aerowinx 744 Forum only! Testing the main landing gear of the Jumbo Jet! Amazing how the mechanism works. Very interesting: the first video shows the gear swing with different hydraulic systems! Engineering Giants is a documentary series which takes a look at the making of some of the world's biggest machines. This series will go behind the scenes and document what it takes to overhaul a British Airways' Boeing 747-400. This video is unfortunately not available at the moment! All documents were offered as ZIP-archives! If you would like to link to my page, here is a logo pack for you! A ReadMe.txt is included as well! Please do not misuse my logo! Thanks a lot! Measurements of old Boeing aircraft - again ex Project777! 161 pictures of the former Lauda Air B 777 flightdeck, Klaus and I took years ago. The file is approx. 48 MB. Have fun! This is the great guide "Panel building focused on dimensions" from Hessel Oosten. This is a recommended reading if you want to build you own panels! All credits goes to Hessel, I'm simply hosting this file. Thanks for giving me the opportunity, Hessel! Get the free Adobe Reader from the Adobe website! Simply click the logo to follow the link. If you have an interesting link, please drop me a line! I am in no way affiliated with any of these sites. I have no influence on the design and contents of third party internet websites. I therefore expressly distances myself from the material of all third party internet websites, even if my website links to these external sites! As soon as an infringement of the law becomes known to me, I will immediately remove the link in question! Flightdecks, panels and interfacing hardware for a huge variety of aircraft. First quality! Hardware - MCP and EFIS for B 747 & B 737 as well as FCU for Airbus - and more! Flightdeck hardware, parts and interfacing products! Throttletek offers custom made throttles and flight controls for your specific needs! Quality parts of B 747-400 as well as Airbus just to name a few! Perfect contact! Good replicas for Knobs, Tiller, Rudder, CBs, Map Lights, Yokes and much more! Dean offers new DZUS quarter turn fasteners as well as rivets, nuts, studs etc. via ebay! Offers a comprehensive high-quality range of services: CNC-turning, milling, welding etc.! Stackable boards for integrating real aircraft & aftermarket panels with simulator software! Parts heaven for the fellow sim builder! If not there, you won't find anywhere! Great site for used cockpit and passenger seats! Located in Austria! Boeings greatest competitor and vendor of the double-decker A 380! Again: Models, Collectibles, Accessories, Toys and more ...! Austrias first private simulator center, housing an A 320, B 737 and Bell 206 simulator! One cockpit, two pilots, six cameras! The concept of the best aviation videos! I'm MSN 002 ;o), born February 20, 1965 in Vienna / Austria! I'm a self-employed IT-Professional, starting my career 1983. 1991 I fell in love with aviation. My favorite plane is - of course - the Queen Of Skies! I spent dozens of hours in several simulators around the globe! 1997 I built my first 'simulator'. Pictures are in my Gallery on this website. In the meantime I have lot of genuine Boeing parts at home. 1999 I became father. My son Gregor was born in May. November 2000 my dad had his 80th anniversary. My birthday gift: a trip to Lufthansa Trainings Center in Frankfurt, in March 2001. We had two hours in a B 747-400 full-flight simulator. The next day we spent six hours at Lufthansa Technik's base at Frankfurt airport! It was a stunning experience for both of us! My dad loved the sim trip, as you can see on the old Polaroids! The next years I worked continuously on my sim setup. Purchasing, cleaning, painting new parts. Building a base construction, linking rudders and control columns were the main tasks! See my pictures. Early 2007 I startet a long break, because my dad passed away! 2013, after a long time of suffering, my mom followed my dad! November 2007 we had access to an Austrian B 767. My son enjoyed the cockpit! 2012 I had a sidestep to the Airbus family. 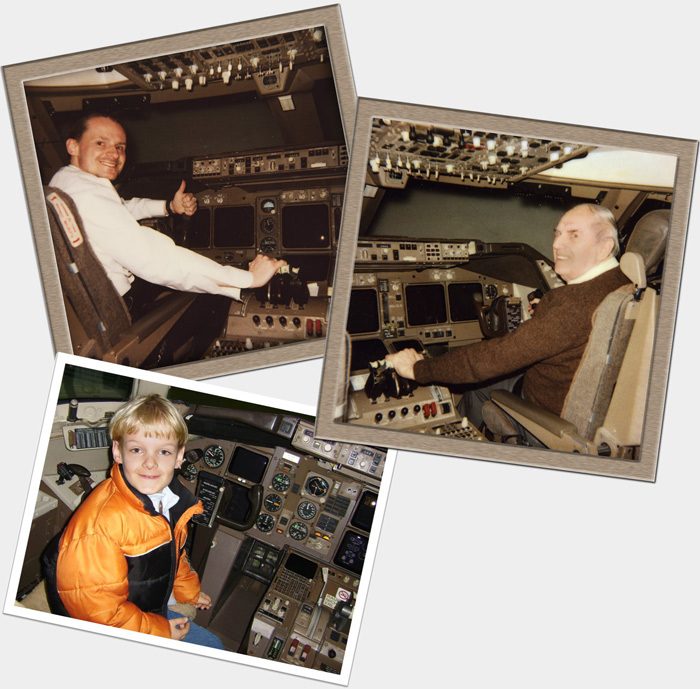 I worked as a freelancer simulator instructor at ViennaFLIGHT for two years! Very interesting to learn about the A 320 systems. Now, 2014, motivated by PSX, I found my way back to the B 747-400 and my simulator! Here we go ... !! Any questions? Please use the Contact tab! Send me an email if you have any questions regarding my project or this website! If you want to send me an email, please complete the following form and I will respond as quickly as possible! I do, of course, respect data privacy and assure you that your personal data will be treated as strictly confidential! The information contained in this website is for general information purposes only. The information is provided by B747-400.net and while I endeavour to keep the information up to date and correct, I make no representations or warranties of any kind, express or implied, about the completeness, accuracy, reliability, suitability or availability with respect to the website or the information, products, services, or related graphics contained on the website for any purpose. Any reliance you place on such information is therefore strictly at your own risk. Through this website you are able to link to other websites which are not under the control of B747-400.net. I have no control over the nature, content and availability of those sites. The inclusion of any links does not necessarily imply a recommeation or endorse the views expressed within them. Please let me know if you find a broken link! Every effort is made to keep the website up and running smoothly. However, B747-400.net takes no responsibility for, and will not be liable for, the website being temporarily unavailable due to technical issues beyond my control. Unless otherwise indicated, all materials and contents found on this website are subject to and protected by copyright owned by B747-400.net. Concept, site design, content, pictures and codes are property of Hans G. Schuetz and B747-400.net (former Project777.com), if not explicit stated otherwise! I'm proud to offer my RSS feed! Here you can easily subscribe to my news updates. Simply by using my RSS feed service! Subscribe to this service by use of MS Outlook, any RSS reader (or "aggregator") or any web-based news reader. There are several software products or apps available that you can download for free! At any time you can stop receiving, or unsubscribe from, my RSS feed! If you would like to learn more about RSS: this Wikipedia article is a good source.